It’s not just a product. it’s clean skin science. Through advanced proprietary chemistry, AlumierMD has optimized the bioavailability of each molecule in their ingredients. 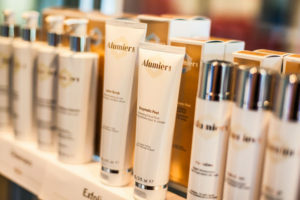 AlumierMD is a medical skin care line which uses innovative ingredients and advanced delivery systems. These products address a multitude of skin concerns, deliver results, and perform progressively over time. Glow Peel - This skin treatment delivers results! A light brightening resurfacing treatment that improves the signs of aging, acne and hyperpigmentation with minimal down time. $150 includes a post-peel kit, three products containing gentle and soothing ingredients, specially designed for post-procedure skin. Luxurious Lionsgate Facial - This skin treatment is all about relaxation! A customized skin treatment for your concerns and challenges. Starting with cleansing and preparing the skin, an enzymatic retexturizing treatment, brightening accelerator, and a customized blend of serums and treatment products. We also include a luxurious eye treatment with AllumierMD Eye Rescue Pads which you get to take home with you. This treatment also includes massage of the face, neck, shoulders, arms & hands. Express Treatment - No Fluff! This targeted facial treatment is designed for those who are strictly down to business. We cleanse and exfoliate the skin, then apply a customized mask. A targeted treatment serum which is specifically deigned for your skins needs, finished with an eye cream, moisturizer and SPF. Alia is brow obsessed…come let her obsess over you! *other areas available upon request. Don’t forget to check out our microblading service for a more permanent brow!